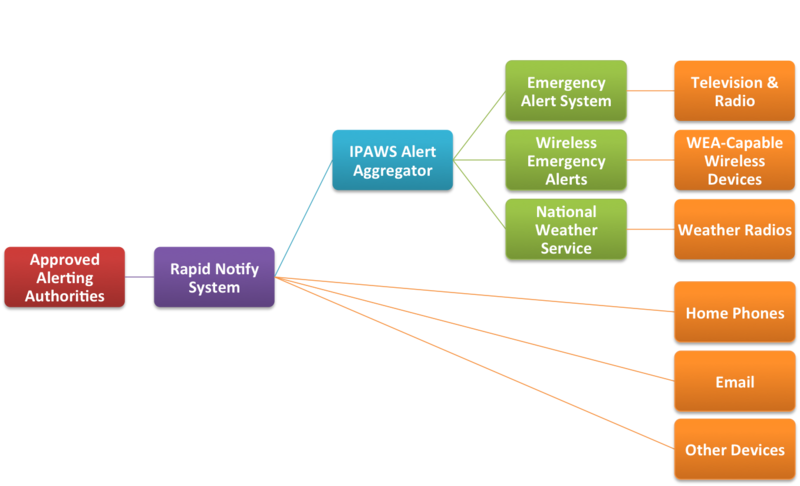 More and more government agencies are signing up for access to the Integrated Public Alert and Warning System (IPAWS). FEMA has made it easy to learn about the system with a free online course. The goal of the three-lesson course is to provide best practices, increased awareness of the benefits of using IPAWS for effective public warnings, skills to draft more appropriate, effective, and accessible warning messages. Wireless Emergency Alerts (WEA), sent via IPAWS, are only just starting to be utilized. They are still largely unknown to the general public. Ready.gov has an extremely helpful PSA video as well as answers to frequently asked questions about the system. WEA emergency messages can be sent by authorized government alerting authorities through your mobile carrier for situations such as extreme weather, and other threatening emergencies in your area, AMBER Alerts, and Presidential Alerts during a national emergency. The subject of IPAWS comes up often with our customers and it can be a confusing and complicated system to explain. We updated our comprehensive white paper explaining what IPAWS is, what it can do for you, and how it works in connection with the Rapid Notify system. We highly recommend you download the paper today. A recent study conducted for the U.S Department of Homeland Security by the National Consortium for the Study of Terrorism and Responses to Terrorism (START) has suggested some fundamental changes to the Wireless Emergency Alert (WEA). Primarily, WEA messages need to be longer suggests the study. Currently WEA messages only offer 90 characters and do not allow a URL to be included. START recommends consideration of adding URLs to WEA messages to direct recipients to websites for additional information. WEA messages could potentially be more effective if the information is given in a different order. Currently, WEA messages must provide information in the following order: hazard, location, time, guidance and source. START suggests an alternative order: source, guidance, hazard, location and time, to improve likelihood of action taken in response to the message. The recent order by the FCC to change the name of the Commercial Mobile Alert System to Wireless Emergency Alerts (WEA) is one of many ways that the government is working to make FEMA’s Integrated Public Alert and Warning System (IPAWS) a success. As a reminder, WEA alerts are short 90-character, text-like messages that alert people in three types of emergency situations; Presidential Alerts issued by the President or a designee, Imminent Threat Alerts that include severe weather or natural disasters, and AMBER Alerts. All major commercial mobile service providers offer WEA capable phones with the service already opted-in so that the public does not need to sign up to receive the alerts. WEA alerts do not trigger charges for the alerting authority sending the message nor the individual receiving it. Cell phone owners with a WEA-capable mobile device physically located in an area where an alert has been sent will have the ability to receive the alert. Access to IPAWS is free, however to send a message using IPAWS, an organization must apply to become an Approved Alerting Authority and procure its own IPAWS compatible mass notification software, such as Rapid Notify.